Dreams Never Die When You Believe in Them Phoebe Lapp's grandmother was anything but ordinary. Before her death, the eccentric elderly woman purchased three Assateaque ponies, seemingly for no reason. 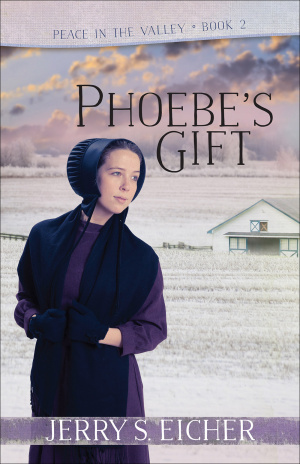 But after her passing, Phoebe learns of her beloved grandmother's wish to start an Amish pony farm in Lancaster County for hurting Englisha children. That dream now lies with Phoebe if she decides to fulfill it, but a teaching position is waiting for her at home. Which path should she choose? Further complicating her decision, Grandma Lapp's young neighbors, David Fisher and his sister, Ruth, are to be involved in running the farm. David and Ruth have yet to abandon their rumspringa, and the only reason they haven't left the church already is because of Grandma Lapp's kindness. Unbeknownst to Phoebe, David has secret hopes of attracting her affection. Phoebe knows she has some difficult choices to make whether or not to honor her grandmother's legacy and what to do about David's growing attentions toward her. But she's not alone. God is with her every step of the way. Phoebe by Eicher, Jerry S. was published by Harvest House Publishers in August 2017. The ISBN for Phoebe is 9780736969321.